(Lanka e News -20.Nov.2018, 11.00PM) “ Make no mistake, Mr. President. 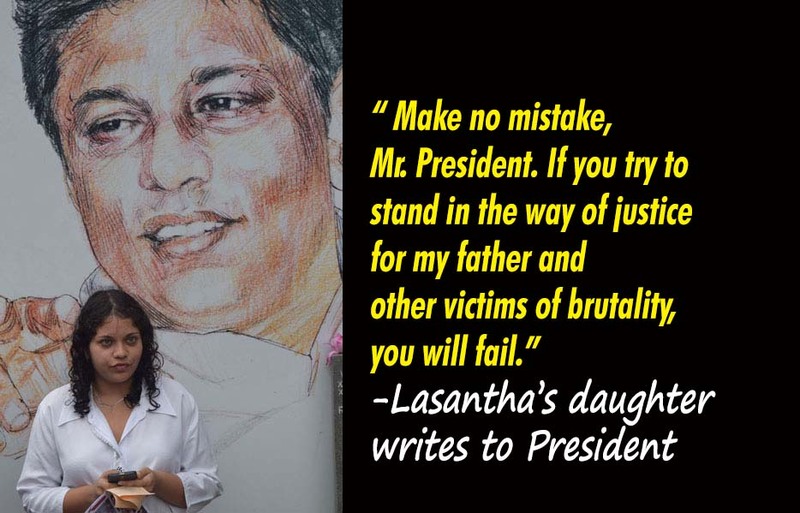 If you try to stand in the way of justice for my father and other victims of brutality, you will fail.” Ahimsa Wickrematunge, the daughter of Lasantha Wickrematunge, writes a letter to President Srirsena and condemned the move to transfer CID OIC Nishantha Silva who was handling investigations into the murder of Wickeematunga. Ever since I got to meet Nishantha Silva, I was struck by his gentleness, humility and dedication to his job. I started following his work and was stunned by the number of high- profile cases that Nishantha Silva is handling. He is also the lead investigator into the brutal May 2008 abduction and torture of journalist Keith Noyahr. Nishantha Silva’s team reconstructed and scoured millions of telephone records, recorded over one hundred witness statements, located the military intelligence safe house in which Keith Noyahr was tortured, recovered documents proving the safe house was leased by military intelligence, and arrested eight military intelligence officers including the former army chief of staff. Seven of these suspects were from the infamous “Tripoli” white-van platoon implicated in the murder of my father. Heck, he even found the infamous “white van” and brought it before court. This engine of death was a symbol of your election campaign, emblematic of the vicious brutality of your opponents. One would have expected you promote the man who found it and not try and sabotage his career. In fact, Inspector Silva may have been able to figure out the nexus between the Tripoli platoon and the chain of command if you had not personally ordered the military not to cooperate with the investigation on so-called “national security” grounds when the CID and the court requested essential documents and records of the army and defence ministry. Nishantha Silva has also beenthe lead investigator into the brutal abduction and murder of eleven young men in 2008 and 2009 after their desperate families had been extorted for ransom, allegedly by several senior naval officers whom Inspector Silva has meticulously identified and arrested. It was Inspector Silva who had the unprecedented courage to share with an open court evidence that your former navy commander, now Chief of Defence Staff, was instrumental in harbouring and smuggling out of the country a fugitive navy officer involved in these grisly murders.